I love walking into our hallway and seeing photos of my family. I’m transported back to the moment each was taken, some wonderful memories. My favorite thing to do is walk Annie down the hallway before bedtime. We stop at each photo and she tells me who each person is. Sometimes, Annie will lean in and give kisses to everyone in the pictures. It’s adorable, and so sweet. She ALWAYS wants to kiss the pictures of Maddie. She recently learned the word “sister,” so she’ll say, “kiss sister Maddie.” Or, in Annie speak, “kiss tister naddie,” but you get the idea. I never expected it, but kissing pictures with Annie has become one of my favorite rituals. Now I’m extra glad I stayed up until 4am picking out photos. Good work Mama! So much sweeter than the pictures of (what was it? boats?) that came with the frames. And what a sweet ritual. I love when something unexpected becomes a special tradition or ritual for me and the girls. I have to tell you…your photo wall looks so so so so sooooo much better than mine! You have some fabulous pictures! 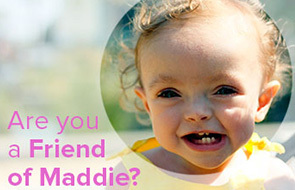 I love the big one you chose of Maddie! Annie’s is spectacular as well. You did a great job…worthy of 4 a.m.!! Your wall is lovely Heather!!! I’m so happy it brings you so much peace….I hope it will continue to do so for always and always!!! Beautiful!! And what a beautiful ritual with Miss Annie! What a heart-warming post!! I am sure Maddie is smiling and clapping as she sees her sweet little sister giving her love!! What a gorgeous collection of photos. I love that it has created that little ritual of photo naming and kissing with you and Annie. It’s lovely–your family is so special. What a sweet ritual, indeed. What a comfort this ritual must bring to your heart, Heather. I love that it brings much happiness to you. I’m sure it’s your most treasured spot in your beautiful home. That is SO sweet, and the pictures look wonderful! The hallway looks wonderful! Totally worth staying up so late. And what a wonderful ritual. It may be how you wrote the post or the pictures, but I felt just a little bit of healing in your post. I hope that is true. Much love to you all. I love it. We have started something similiar in the foyer of our house, it is one of my favorite spots now. When my brother passed in 93 she did the same thing with his picture. It was her ritual. Peace & strength to you all! So beautiful. You did a great job with the pictures. This is so sweet and so special! I love how your photo gallery turned out. Beautiful wall of pictures. Beautiful family! I remember you were struggling with the choice of which picture of Maddie to put in the large frame. The one you picked is wonderful. for some reason I also love to look at my kids pics and remember what they were like at that time in the age they were. I think pictures are magical! That wall looks wonderful, you choose great photos and beautiful frames. I so want to do the same in a hallway in my home. Your little ritual is so wonderful and I must admit, hearing that Annie is learning the word sister and is able to kiss the picture of her sister made me choke up. It so sad that these little ones of ours won’t ever get to play with their big siblings the way they should. They are a blessing, but man is there a big void where our first borns should be. All I can say is WOW WOW WOW. Your photos and frame selection and positioning is perfect. I can see how it makes you happy everytime you see it. I can really tell that it was done with nothing but pure love. You’ve really inspired me to (finally) put up my frames in my house! Great job with the frames/photos – it looks really nice. I’ve only recently put paintings I’ve done up on the wall, and it turns out that it was the missing link to making this space feel more like home rather than a big white room. This is a precious story. Have me goosebumps. I love your photo wall. The photo of Maddie with her “pig tails” is one of my favorites of her. I loved that set of photos where you had her sitting in the chair and you were playing with her hair..brought back so many smiles to see that pick and think of that series you did. You should be very proud of your beautiful family. I have a similar display going up my stairs and my 2 year old and I start the day by pointing to everyone and saying everyone’s name. This is how he will get to know so many people he otherwise may not. It’s a lovely way to start the day. Blessings to you especially right now. where do you buy your frames? I bought them at Michael’s, they were having a buy one, get one for a penny sale! We have something similar in our front hallway, and one of my boys in particular LOVES to look at them – he will stand under them, pointing saying, “who’s that? Who’s that?” I love that he enjoys looking at photos, especially as we live so far from our family. Aw, that came out just wonderful! I’ve been dying to do a photo array like yours; I have the photos all picked out. Just need to get around to printing and framing them! What a beautiful and inspiring tribute to your family! I’ll definitely have to attempt to be creative as soon as we get into our new apartment. Just came across this old post from your most recent post and was wondering if you have had to add frames for James? We also have a gallery wall, but Im having a hard time finding spots for new frames and Im pregnant with our 4th!! BTW, you did a great job on this. I was actually just at Michael’s the other day looking for matching frames! We luckily have a wall that’s opposite of the gallery that has room for more frames, so I’m going to hang them there and then mix up all the photos. I can’t wait to see that post! Our gallery is in our living room bc our hall way is about 2 feet long, its pathetic!! Maybe I’ll put them there and just go floor to ceiling instead! Can you tell me what sizes of frames and mats you have used here? The large photos are 18 x 24, everything else is a 5×7 or 4×6 collage. I bought them at all Michael’s. Hope that helps! If you happen to remember, cold you tell me the size of the frames? ie, the bog ones… are they 20×20 frames matted down to 18×24?